I've never cared for sports, but I look forward to game day for somewhat selfish reasons: I absolutely love making cute appetizers and party food for friends and family! I've always loved to host events. Deviled eggs were one of my signature finger foods before going vegan – I've probably made hundreds in my lifetime. Luckily, these deviled potatoes are just as delicious, and just as easy to make as the real thing. The recipe for the simple filling is similar to the original, with the addition of turmeric (to mimic the color of yolks) and black salt (to give them an "eggy" flavor). The first time I tested this recipe, I made filling out of only the scooped-out centers of my small potatoes. But the filling is my favorite part, so I decided to add in more cooked potato and double all the other ingredients so that I had an ample amount to pipe into all my potato boats. If you're a stickler about your presentation as I am, you'll want to take the extra steps to puree your filling so that it's smooth enough to pass through the tip of a piping bag. In order to do this you may need to add some extra liquid to maintain the correct consistency, as the blades from your food processor will activate the starch from your potatoes and thicken the mixture. Scrub your potatoes. Cut in half lengthwise and steam for 20-25 minutes, until fork-tender. Allow potatoes to cool slightly until safe to touch. 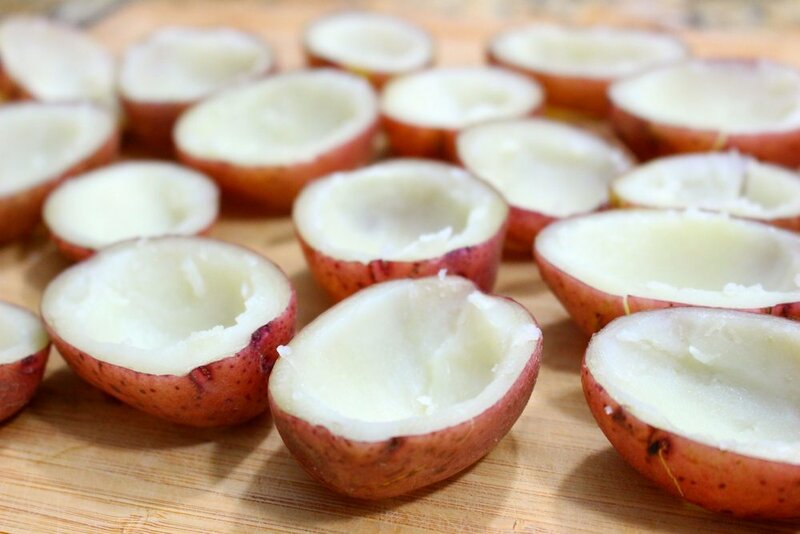 Use a melon baller or small spoon to remove the center of each potato to a separate bowl. Remove as much as possible without breaking through the skins. If you don't have a deviled egg tray to serve your potatoes on, you will also want to cut a tiny piece off of each half of the potato so that they will stand up on your plate. Peel cooked russet potatoes and add to bowl with the scooped-out potato. Combine with mayo, mustard, fresh dill, black salt and turmeric. Taste and adjust with salt and pepper to preference. You can spoon the filling into the potato boats as-is, but if you want to pipe it, you will need to puree the filling first to make it smooth enough to pass through a decorative tip. You may need to add a few tablespoons of plain plant milk to thin it out, as the starch from the potatoes will thicken as you process it. 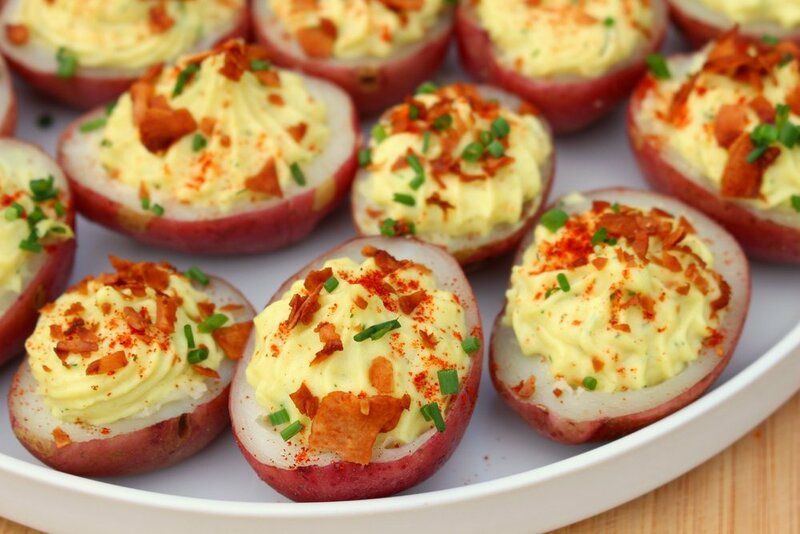 Once you have spooned or piped the filling into the potatoes, garnish with smoked paprika, a sprinkle of chives and coconut bacon. These are great chilled or warmed slightly in the oven.